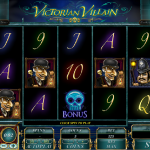 Victorian Villain is a game from Microgaming that will allow you to play the role of a detective in order to solve a mysterious crime. For every clue you pick up you will be awarded with cash prizes. If you have been imagining how it is like to be Sherlock Holmes for one day, now you have the chance to see. Keep your eyes open and sharpen your sense for deduction and make yourself proud by solving the crime. There are 2 bonus symbols, each activating a special feature and a wild symbol in Victorian Villain. The wild`s role is to substitute for every other symbol except for the bonus symbols. The skull bonus symbol appears only on the first, second and third reel and awards you with a choice of free spins. It is up to you whether you will choose 15 free spins with x 3 multiplier, 10 free spins with x 5 multiplier or 5 free spins with x 10 multiplier. The Search for Clues symbol appears on the third, fourth and the fifth reel and it is the key for the Search for Clues bonus round. Once you get 3 symbols you will activate the feature which will take you to a room with different items. Each of these items may be a clue, you just have to pick symbols for cash prizes. 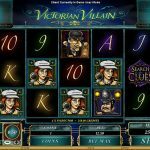 Victorian Villain is by no surprise a very popular slot from Microgaming and that is thanks to its originality. 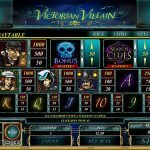 This is one great game where for a moment you forget you are playing an online slot game, but instead some mini games that almost always seem different and your final intention is to catch the killer for some big prizes. If you like something more animalistic then you should consider playing Untamed Bengal Tiger a 5 reel slot by MicroGaming.